Now is an exciting time as your child prepares to enter a new grade as the upcoming school year gets underway. To ensure their success, you have purchased the necessary school supplies and worked to promote their education. But, have you scheduled an appointment with their pediatric dentist in Birmingham for a dental cleaning? If not, you could be allowing an unexcepted dental problem interrupt their school year. Before they head back to the classroom, now is the ideal time to schedule a preventive appointment. Children over the age of one need to see their dentist every six months for a professional cleaning. Unfortunately, only 84 percent had an appointment last year. Although it may not seem important, skipping this visit could lead to unexpected dental issues, like tooth decay, which can cause them to miss days during the school year. Let’s face it, despite your best efforts, your child may not have the greatest oral hygiene habits. Brushing and flossing effectively can be hard for young children. In some cases, they do not understand the importance of oral hygiene, so they may skip flossing or only clean the front surfaces of the teeth. These poor oral habits can lead to an accumulation of plaque and tartar while trapped food particles remain stuck in the teeth. This causes bacteria to sit on the teeth, leading to tooth decay. Cavities are the most chronic problem we treat in young children. In fact, it is estimated that over 18 percent currently have untreated tooth decay. To protect their teeth, they must have a professional cleaning every six months with their children’s dentist in Birmingham. With a regular cleaning, the harmful accumulations are removed from the teeth. In addition, proper oral hygiene habits are discussed to set the right foundation for a lifelong healthy smile. During the appointment, your child will also have a comprehensive checkup. This allows their dental health to be monitored to detect issues, like tooth decay, while they are still small. With prompt intervention, it reduces the potential for a dental emergency occurring throughout the school year while keeping their teeth and gums healthy. In addition, preventive treatments, like dental sealants and fluoride treatments, will also help to protect the teeth from decay. As you get your child ready for the school year ahead, make sure a preventive appointment with their dentist in a top priority. Dr. Angelica Rohner is a trusted pediatric dentist who provides compassionate care for children of all ages. 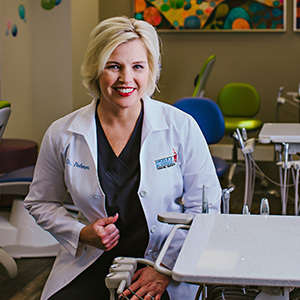 After receiving her D.M.D degree from the University of Mississippi School of Dentistry, she completed her residency in pediatric dentistry to meet the unique needs of children. To promote the health and development of your child’s smile she is available to answer your questions. Contact Dr. Rohner today to schedule your consultation for a healthy, beautiful smile.